a rawlings (CA/IS), Aina Villanger (NO), Ane Nydal (NO), Ann Jäderlund (SE), Ariana Reines (US), Colin Browne (CA), Eduardo C. Corral (US), Erling Kittelsen (NO), Gunnar Wærness (NO), Guntars Godiņš (LV), He Dong (CN), Jamshed Masroor (PK), Jordan Abel (CA), Juris Kronbergs (LV/SE), Liāna Langa (LV), L inda Klakken (NO), Monica Aasprong (NO), Morten Wintervold (NO), Sigbjørn Skåden (NO), Siri Katinka Valdez (NO), Synnøve Persen (NO), Terje Thorsen (NO) and Victoria Kielland (NO). 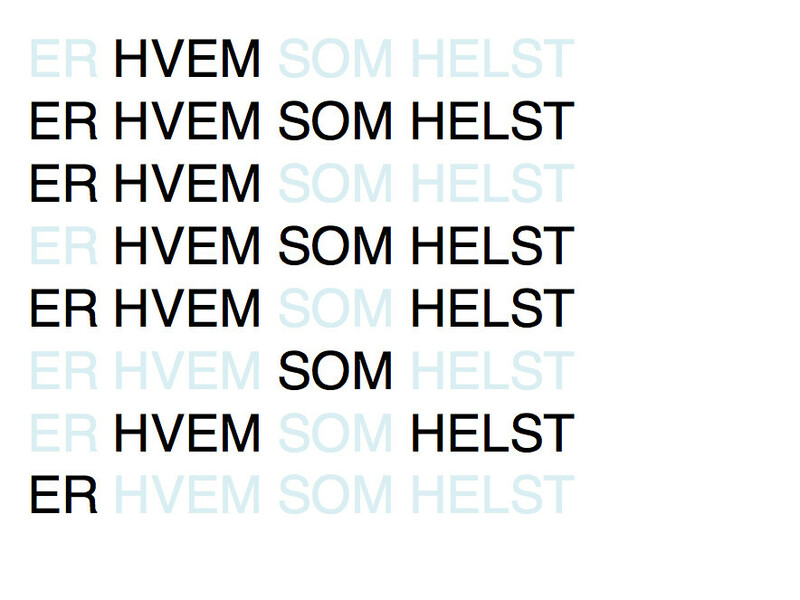 The first of a series of forthcoming presentations in OSLO PILOT’s Project Room, The Word’s Head launches with a month-long installation of printed texts composed by participating poets, which will also be available to the public as individual takeaways in the space. In addition to marking the first presentation in OSLO PILOT’s production space, The Word’s Headinaugurates the use of OSLO PILOT’s Risograph printer, an independent publishing tool that will be used throughout the course of 2015 and 2016 to produce various editorial projects. OSLO PILOT’s turn to poetry for this first project reflects a deep investment in the unique potential of poetic language to enrich, abstract, and provoke thinking around the project’s lines of research and their underlying relationships to time. The second stage of the project will comprise a series of performances and readings exploring the intersection of poetry and the live event. These events will take place throughout the one-month span of the presentation in the Project Room and will include a launch event for The Word’s Head Catalogue on 4 December. The final stage of the project moves the texts out of the Project Room and into the public realm. For eleven months following the initial presentation, each work will be distributed through various facets of the public sphere including city walls, newspapers, and social media. This gesture not only inserts these texts into new contexts, presentational media, and economies of production and circulation, it enables the poems to evade any sense of a definitive format, significantly broadening the possibilities for engagement and interpretation. The Word’s Head poets were selected by, and include contributions from, the members of the Cycle Wording Editorial Advisory Board in conjunction with OSLO PILOT curators Eva González-Sancho and Per Gunnar Eeg-Tverbakk. The Board is comprised of eight members: Aina Villanger, Erling Kittelsen, Gunnar Wærness, Juris Kronbergs, Knut Åsdam, Monica Aasprong, Rob Stone, and Sigbjørn Skåden. See Cycle Wording for information on this initiative. See Team for more information on Oslo Pilot’s Editorial Advisory Boards.